Occasional-Cortex fantasizes about socialist Utopia! Once you give AOC power, reality will intrude, as it always does after socialists obtain power. The photos of puppies, happiness, and caregivers lavishing support and care over the elderly will give way to the fact that the Utopia the socialists envisioned is being impeded by the people who are supposed to live and love in the Utopia but who seem to be angry and frustrated with what is delivered. The cure is always the same; the government expropriates more businesses causing needed goods and services to dry up, angering the people more. Lather, rinse, repeat once the animosity reaches a crescendo, the socialists in power crackdown and kill a few thousand. Lather, rinse, repeat. Harrowing pics show starving Russians selling human body parts as MEAT during Holodomor! The photos at the link (and below the break) are not for the faint of heart or weak of stomach. They show the real Utopia which socialism brings. This is not a one-off. Similar photos are routine in end-stage socialist countries. They happened in Mao's China, Pol Pot's Cambodia, Kim's North Korea, and they are happening now in Venezuela. These revolutions are always brought about by attractive, earnest, useful idiots like Occasional-Cortex. These fools are true believers in the socialist fantasy and help usher in the harsh, gritty, dystopian reality. Even here in America, the progressives (the American version of socialism lite) destroy all they touch. The cities run for decades by progressives are in shambles. The people who vote for the progressives are increasingly broken and battered. Take a bite from the socialist Utopian apple at your peril. ​Transit ridership by commuters is sticky, while for non-commuters it is not! During my decades of commuting into Portland's downtown core, I found that the cost, traffic, and problems of driving when compared with the inconvenience of public transit made them rough equals. My driving commute was 10 -12 minutes, my bus commute was a solid 35 minutes. Some of that time difference was eaten up by the fact that I had to park in a cheap lot, pay, and walk 1/4 mile to the office. I mostly drove to work because I often had depositions or hearings across town which required an auto. In the end, I would take transit on nice days when I had no paid monthly garage. Once I paid for the monthly garage in the building, my driving commute had so few inconveniences that I stopped bus commuting. Transit was super cheap, saved me some hassle, but took more than three times the commute time. I understand why people might take public transit to commute. It is easy to understand why they would not take public transit for non-commuter trips. We are wealthy enough that we do not need to take public transit for non-commuter trips, so we don't. ​Chicago has become a city filled with feral people! This is what decades of progressivism buys. Yeah, burning batteries are pretty toxic so roast 'em quick! I would never park one of these in my attached garage, or attach one of Elon Tesla's whole house batteries to the house. I don't want to be the weenie roasted! Incentives do matter. People are moving from high tax states to low. The intelligence test is whether they will take with them their idiotic political ideas which created the high tax dystopia from which they just escaped. If they do not, all will be well; if they do, they will quickly create the same dystopia as the left. Who knew you could fail an intelligence test? It is long past time to open source our intelligence gathering! Politics now trumps national security for our intelligence agencies; this is a disaster in the making. Lots of someone's need to go to prison over this! ​Beto is God's gift, the poor should give to Beto! Why Bozo doesn't give to the poor! Not only that, he should be able to deduct all of his charitable essences from his taxes as well, leaving the government owing him trillions of dollars or something! ​The Stupid Party is ready to steal defeat from the jaws of victory! The Stupid Party is the progressive wing of the Republican Party. Stop listening to these lollyknobs! Global warming is a fraud perpetrated by pseudoscientists who receive huge research grants and stipends for saying what the politicians want to hear. "Black curve, global temperature reconstruction by Marcott et al., 2013, as in figure 37. Purple curve, Earth’s axis obliquity cycle. Red curve, CO2 levels as measured in Epica Dome C (Antarctica) ice core, reported in Monnin et al., 2004. Blue curve, methane levels as measured in GISP2 (Greenland) ice core from Kobashi et al., 2007. Notice the great effect of the 8.2 kyr event on methane concentrations. Green curve, simulated global temperatures from an ensemble of three models (CCSM3, FAMOUS, and LOVECLIM) from Liu et al., 2014, show the inability of general climate models to replicate the Holocene general temperature downward trend. Pink bar, 8.2 kyr BP climatic event. Major Holocene climatic periods are indicated." Ok! That makes things a bit more complicated but look at the black line, the proxy temperature reconstruction, and the green line the average of the three climate models. They do not mirror, in fact, they are opposites. The reconstruction rises first, then falls over time, while the climate models start low and slowly rise over time. This has reinforced my understanding that the climate models used by the climate alarmist are valueless, and cannot be used for any real world climate modeling. So, the Alarmist's models are bupkis. You should also note that the black line spike at the end is driven by extensive data fraud, manipulation, and chicanery. Instead of using the raw data, the Alarmists manipulate the data subtracting temperature from older data and adding temperature to new data. Why? Because the data is not cooperating with the fraudsters desires. Regardless, the spike is manufactured. It certainly exists to some extent, but the fraud magnifies it making it unusable as a valuable piece of data. 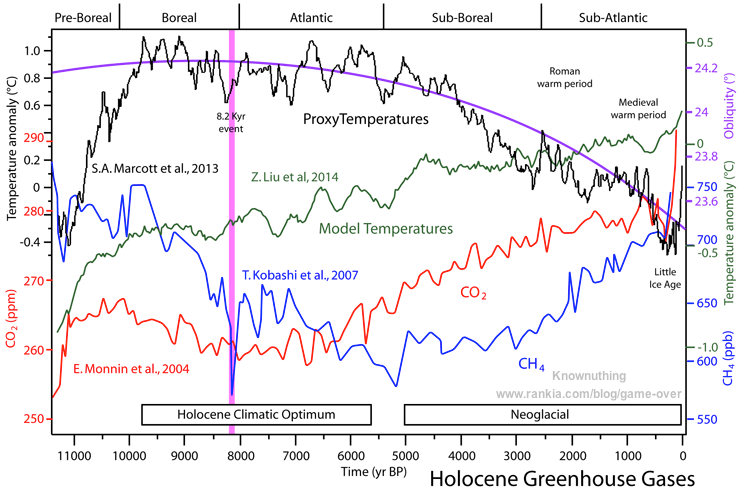 The Earth during the Holocene Climate Optimum temperature anomaly was about 0.9˚(C). Today we are something less than the temperature graphed which is 0.15˚(C) or so. We have a long way to go to get back to the Holocene Climate Optimum average temperature. The second thing to note is how closely the temperature anomaly follows the Earth's axis obliquity cycle and how it is inverse of CO2 except for a few years at the beginning and end of the graph. Thirdly, notice that our present temperature anomaly (based on fraudulent data) has approximately returned to the Mideavel Warm Period temperature anomaly, but remains significantly below the Roman Warm Period temperature anomaly and far below the Holocene Climate Optimum temperature anomaly. Fourth, after the unprecedentedly long and deeply cold Little Ice Age drop out in the temperature anomaly, we should have expected the Earth to begin warming just as it has done after every cold drop in this "sawtooth" graph of Earth's temperature anomaly. What we should want is a return to the Holocene Climate Optimum not a return to the Ice Age. The climate alarmists seem to want a return to the ice age with its death and deprivation for not only humans but all life. There is scant evidence that the current temperature anomaly is due to anything but natural causes. We have vanishingly little data over a tiny few decades which the climate alarmists point to as their entire evidence package. In fact, the entire global warming period which the climate alarmists point to comprises the years, 1978 to 1998, before that the Earth was in a 30+ year cooling trend, the amount of carbon being produced was insufficient to drive global warming (according to the climate alarmists), and after that the Earth has not been warming (again according to the climate alarmists). These lollyknobs are hanging their hats on 20 years of warming data to prove that in 100 years the temperature will be ... Oh, STFU ... Making claims like that about the most complicated system on Earth with scant data is cultish lunacy. Global warming is a secular totalitarian cult. Crichton nailed who these people are, and what drives them. Today, one of the most powerful religions in the Western World is environmentalism. Environmentalism seems to be the religion of choice for urban atheists. Why do I say it’s a religion? Well, just look at the beliefs. If you look carefully, you see that environmentalism is in fact a perfect 21st century remapping of traditional Judeo-Christian beliefs and myths. There’s an initial Eden, a paradise, a state of grace and unity with nature, there’s a fall from grace into a state of pollution as a result of eating from the tree of knowledge, and as a result of our actions there is a judgment day coming for us all. We are all energy sinners, doomed to die, unless we seek salvation, which is now called sustainability. Sustainability is salvation in the church of the environment. Just as organic food is its communion, that pesticide-free wafer that the right people with the right beliefs, imbibe. Eden, the fall of man, the loss of grace, the coming doomsday—these are deeply held mythic structures. They are profoundly conservative beliefs. They may even be hard-wired in the brain, for all I know. I certainly don’t want to talk anybody out of them, as I don’t want to talk anybody out of a belief that Jesus Christ is the son of God who rose from the dead. But the reason I don’t want to talk anybody out of these beliefs is that I know that I can’t talk anybody out of them. These are not facts that can be argued. These are issues of faith. And so it is, sadly, with environmentalism. Increasingly it seems facts aren’t necessary, because the tenets of environmentalism are all about belief. It’s about whether you are going to be a sinner, or saved. Whether you are going to be one of the people on the side of salvation, or on the side of doom. Whether you are going to be one of us, or one of them. Am I exaggerating to make a point? I am afraid not. Because we know a lot more about the world than we did forty or fifty years ago. And what we know now is not so supportive of certain core environmental myths, yet the myths do not die.'" Crichton on the environmental cult! I argue facts; I don't know why it does not change minds; cultists do not change their minds based on facts. Global warming is religious mythology, as are environmentalism and most of the other cultish beliefs of the secularly religious progressive left. Falling for these religious myths is a failure of reason. It will lead to not just economic destruction but the murder of millions and perhaps tens or hundreds of millions just as the acceptance of the secular cult of socialism did during the 20th century. This is not a game; it is not funny; it is not a benign lark or frolic; it is deadly serious business. At least it is to Antifa, the zealous environmentalists, and others on the lunatic left. ​As Americans become wealthier, we want less transit and more personal vehicle transportation! This seems to surprise the transit planners although it has been trending this way for a very long time. Transit is expensive, slow, doesn't go where the riders want it to go, and is filled with people you would never let into your personal vehicle.